Sleepwalking Stories...: Dog Story: Much BOW WOW about nothing ? Would it comfort dog 'owners' to know that the closest ancestor of the animal is the wolf? Just like its ascendant, the dog is a pack animal. When a dog has to live with humans, as is so often the case, they make us part of the pack. Of course, you are not supposed to walk naked on four legs, bark at strangers and howl in communion - a dog's brain is not as devilishly evolved (as ours) to impose themselves on any other species. So we enforce ourselves on them, and they become our 'pets'. 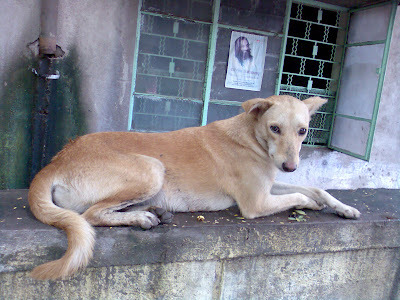 Then there are the strays, the 'free dogs' who loaf around as they please, when not dependent on their human friends for food. Subsequent posts will feature photographs of this unique species, captured during my wanderings around the city. If any reader has had the misfortune of been bitten by a dog (or dogs), please forgive them. For they do not bite without any provocation or rabies, unlike certain human beings who kill and maim each other for no apparent reason.